Patty Carroll has long been in interested in the vivid colors and iconography of American pop culture. Drawing on contradictions of fiction and reality in commercialized American culture, Carroll projects feelings of loneliness and desperation within artificial, brightly lit environments. 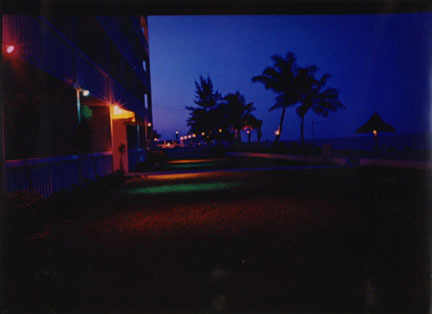 The result is an eclectic collection of suburban lawns, resorts, diners, and low life places shot at night. Carroll’s taste for glitz and bright hues are also recognizable in her pictures of Elvis impersonators, who are photographed on blank backgrounds - a style reminiscent of headshots or fake movie stills. In the late 1980s, Carroll was selected to participate in the Changing Chicago documentary project. 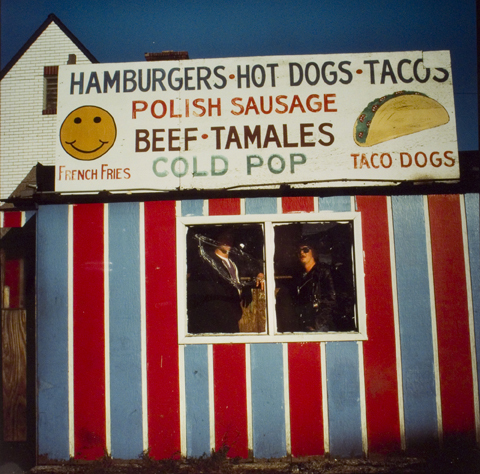 She photographed some of the 2,000 hot dog stands in Chicago, a cultural staple to the city’s urban landscape. Interested in the history of these popular establishments, Carroll was also drawn to the vibrant, eccentric, and even comical characteristics of their hand-painted signage. Independently run, the simple storefronts each have a unique style indicative of the owner’s personality and the neighborhood it inhabits. The project has since evolved to photographing hot dog stands around the United States, and the publication of the book Man Bites Dog (2012). One of the largest documentary photography projects ever organized in an American city, Changing Chicago commissioned thirty-three photographers to document life throughout Chicago's diverse urban and suburban neighborhoods. The project was launched in 1987 to commemorate the 150th anniversary of the invention of photography and the 50th anniversary of the Farm Security Administration documentary project, which provides its inspirational model. 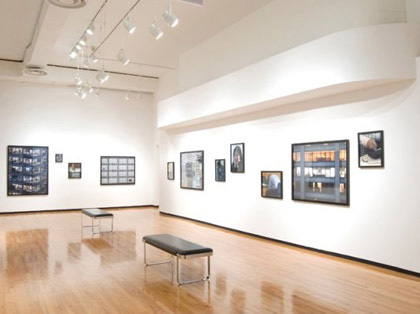 Changing Chicago honors the tradition of the FSA project, but it moved away from its predecessor's ambition of inspiring social change towards the more general goal of providing a nuanced description of the human experience in a particular geographic area. Sponsored by the Focus/Infinity Fund of Chicago, the project was organized with the support of the Museum of Contemporary Photography, the Art Institute of Chicago, the Field Museum of Natural History, the Chicago Historical Society, and the Chicago Office of Fine Arts, Chicago Public Library Cultural Center. In the spring of 1989 the five institutions mounted concurrent exhibitions devoted to the project. Patty Carroll was born in 1946 in Chicago, where she continues to live and work. She completed a BFA in Graphic Design from the University of Illinois, Champaign-Urbana (1968) and an MS at the Institute of Design, Illinois Institute of Technology, Chicago (1972). Carroll has taught at a number of schools including Studio Art Centers International in Florence, Italy; Royal College of Art in London, England; Aegean School of Fine Arts, Paros, Cyclades, Greece; and serves on the faculties of both the School of the Art Institute and Columbia College Chicago. Carroll’s work has been featured in numerous international exhibitions, including at the Royal Photographic Society in Bath, England; the White Box Museum in Beijing, China; the Galleria Gagliardi in San Gimignano, Italy; and the Museum of Contemporary Photography. Her work is held in numerous collections, including the Museum of Modern Art in New York; the Smithsonian Institution and Library of Congress in Washington D.C.; the Art Institute of Chicago and Museum of Contemporary Art in Chicago; California Museum of Photography in Riverside, California; and the Bibliothèque nationale de France, in Paris; among others. Carroll is published in Women Photographers (1990) and Changing Chicago (1989), and her books include: Spirited Visions: Portraits of Chicago Artists (1992), Culture is Everywhere (2002), and Living the Life: The World of Elvis Tribute Artists (2005). 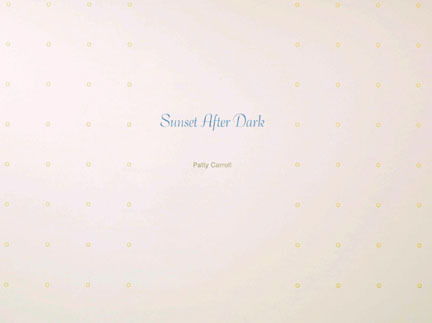 "Sunset After Dark" portfolioCarroll, Pattyn.d.